Infrared images of Uranus' two hemispheres taken with the Keck telescope July 11 and 12, 2004. The planet's north pole points down and to the right. Weird waves in Uranus' rings suggest there might be two tiny, unknown moonlets orbiting there. Researchers know little about the distant, icy planet Uranus compared to other planets in the solar system. Only one spacecraft has flown by it, Voyager 2 in 1986, and scientists have pieced together the rest of their observations through views from Earth-based and orbiting telescopes. The planet has rings — narrower and much darker in color than most of Saturn's, with uneven widths and strange, sharp edges — and is tilted dramatically on its side, giving rise to decades-long seasons and extreme weather patterns. Robert Chancia, a graduate student at University of Idaho, Moscow, investigated the patterns created when Voyager 2 beamed radio waves through the planet's rings toward Earth. Based on how much light makes it through the rings, researchers can discern how much ring material there is at a particular spot, Chancia told Space.com. This image of Uranus from Hubble Space Telescope's Near Infrared Camera and Multi-Object Spectrometer, taken in 1997, caught the planet's rotation and the movement of many of its moons over the course of 90 minutes. The three colors on the body of the planet correspond to three wavelengths of infrared light; blue indicates clearest atmospheric conditions, penetrating further down, whereas green shows a haze of methane gas and red shows hydrogen. And he found something unexpected around two thin inner rings, called alpha and beta: "At the edges of the rings … it's almost like the amount of stuff is going up and down in a periodic fashion that looks kind of like a wave, with crests and troughs," Chancia said. "It seems consistent with something disturbing the rings there," he added. The waves' composition seem to reflect the rippling wake of a passing moon, Chancia said. Plugging the data into a model used to discover one of Saturn's moons, the group found that the waves could be caused by small moonlets orbiting just outside each of the rings. Although the moons would have moved on from their exact positions 30 years ago, the waves reveal their approximate masses and radial locations, which likely still apply today, Chancia said. To try and verify the new moons' existence, Chancia combined Voyager 2 images of the planet in which the moons should have been visible. While other known moons were highlighted using this method, the potential new moonlets did not materialize. "Based on the amplitude of this wave pattern and that distance from the ring … and our attempts to find the moon in images, it basically points toward if they exist, they're pretty tiny," Chancia said. That means the moons are likely smaller than 3 miles (5 kilometers) in radius, which would make them smaller and closer in than any of Uranus' known moons. "The most likely scenario is that it's a small object that's right at the level of the noise in the images." Understanding Uranus' rings, and the moons interacting with them, can help reveal more about the planet's gravity and interior structure. Eight of Uranus' nine main rings are very thin, less than 10 km (6 miles) thick, Chancia said. Researchers aren't sure how the rings stay narrow over time when the particle collisions should cause them to spread out, or how long they've existed around the planet, but the actions of "shepherd moons" orbiting along with the rings may be keeping some of them in line. The moons Cordelia and Ophelia appear to keep Uranus' outermost, widest ring relatively confined between around 20 and 100 km (12 and 62 miles) in width, for instance, and a similar setup may corral one of Saturn's rings. "Finding a small moon like this that could be helping to keep the alpha and beta rings confined and shed some light on that story could help — or just confuse things more," Chancia said. Mark Showalter, a researcher at SETI Institute in California, told New Scientist that the moons' presence is "certainly a very plausible possibility." Chancia said that Showalter and others can investigate data about Uranus from the Hubble Space Telescope to try to scope out traces of the two new moons. 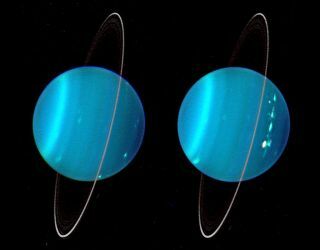 A lot of what scientists know about Uranus came from similar telescope observations, and this data offers the best opportunity to verify the moons' existence, Chancia said — at least until some future mission approaches the ice giant once again. The new work has been accepted to The Astronomical Journal, and is available online at the preprint site arXiv.